When Matt volunteered to apear on Canadian TV, he thought he was going to talk about Windows Phone 7—you know, explain the design philosophy, Microsoft's market position, lay out the competitive landscape. And for a while, that's what he did. Then things got weird. Michael: Thanks, Matt. 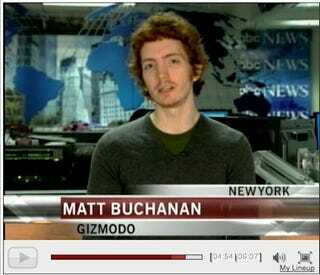 Our guest has been Matt Buchanan, Contributing Editor at Gizmodo. Susan: I can see why you have a man crush on him. Michael: You think he's cute do you? Matt: I can still hear you. Susan: It's too late, Michael. He's gone. UPDATE: Looks like they cut the end of the clip for some reason, from "man crush" to "I do." Canadaaaa!! !